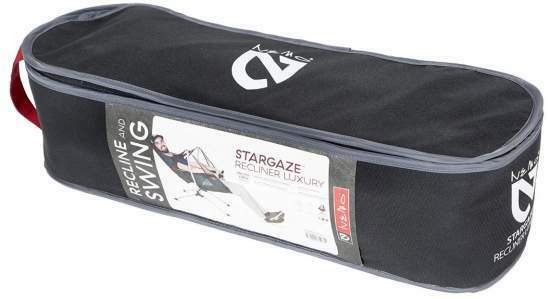 This NEMO Stargaze Recliner Luxury Chair review is about a completely unique collapsible swinging chair with reclining features, headrest, and solid armrests. NEMO Stargaze Recliner Luxury Chair. This cot is available on Amazon. The link will redirect you to your local Amazon store so you might save on shipping. The chair is new on the market and perhaps not available everywhere yet. 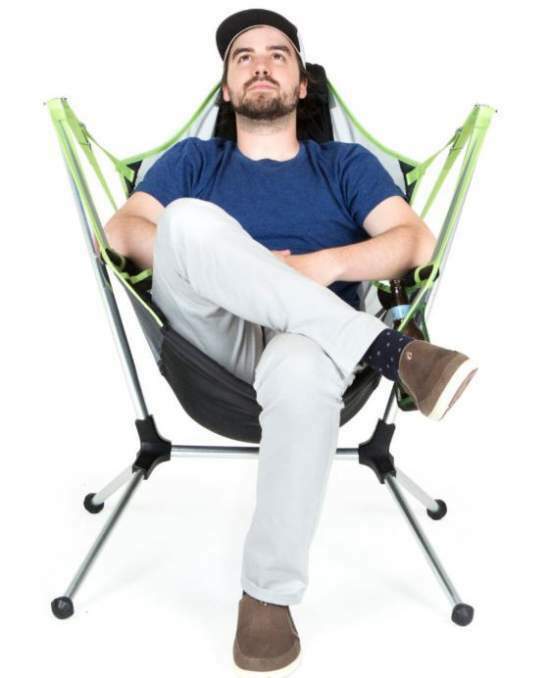 This NEMO Stargaze Recliner is a new and totally unique item on the market that combines features of reclining and rocking/swinging chairs and hammocks for unparalleled relaxation. They have several versions of this chair, so the Luxury model presented here has extra poles on the back which makes it extra tall. Pleasant headrest supported with additional poles on the back. This headrest combined with the reclining feature allows for a deep reclining and a full view of the sky as shown in the picture below. This is a reclining design. Here you have the first ever combination of several features. There are some other rocking chairs here in the site that can keep rocking regardless of on which surface you use it (see some of GCI rocking chairs), but what you have here is totally different. So you will swing on any surface, it does not matter where you use it. So how this works? All you have to do is to lean back to activate the auto-reclining mechanism and enjoy a great view of the stars. As you realize the seat is attached by straps to the two side poles and this is what makes it swing. From the picture below, you realize also that the chair has solid and padded armrests. The back view showing the high backrest and solid armrests. 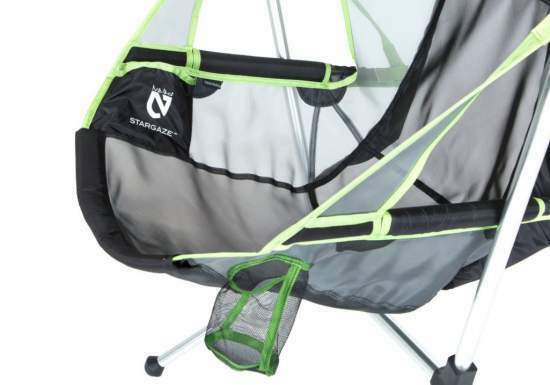 The chair comes with a bottle holder on one side and you have a storage mesh pouch on the other side. Both are visible in the picture below. Storage elements on the sides. Size-wise, the dimensions looks fine (W x D x H) 25 x 36 x 45 inches (65 x 92 x 116 cm). 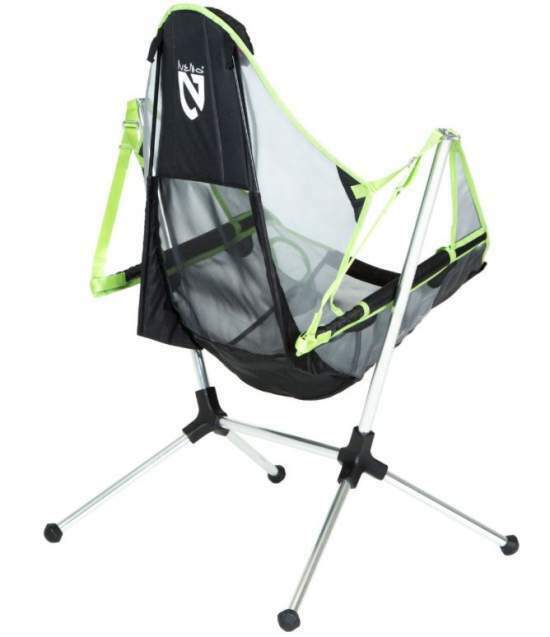 It is high and offers great back and head support. But in the shoulder area the chair is profiled so that it pushes shoulders forward. So it may be uncomfortable for users with a wider body frame. Best suited for users with a narrow body frame. Note that the seat height is 12 inches (30 cm) above the ground at the lowest point, but it is much higher on the front. Capacity-wise, the chair is designed to support up to 300 lb (136 kg). This should be fine for most of the users. There are much stronger chairs out there but nothing similar to this one of course. Weight-wise, this chair is surprisingly lightweight for such enormous poles. 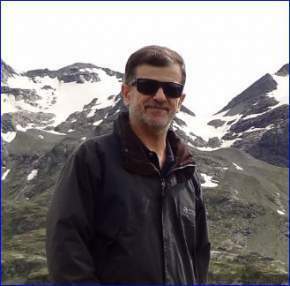 It weighs only 6 lb 5 oz (2.86 kg). 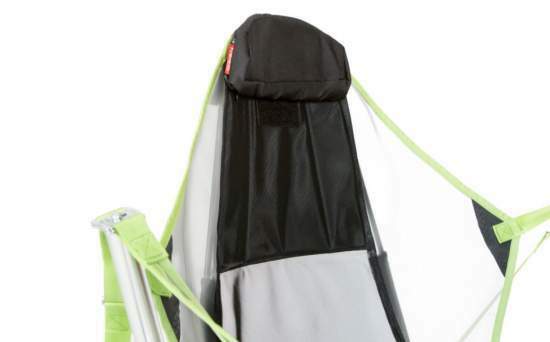 So this is a camping item but in view of its weight and the packed size (more below), it is still backpack-portable. 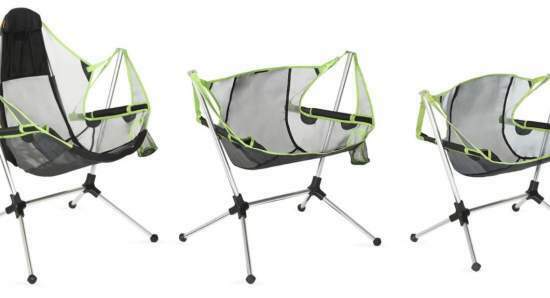 So this is a chair to take to camp, to the beach, for tailgating, or simply to use in the garden at home. Although the chair looks complex, you have only two elements, i) the frame, an ii) the seat. So the suspension frame is built with an aircraft-grade aluminum and the tubes are very thick and strong. They are all shock-corded and this is why you have it as a single piece, you can never lose any part (well, except feet perhaps). The feet are built from a thermo-rubber material and with a geometry suitable for any surface. They are large to prevent sinking, but they will surely sink if the ground is soft. I have seen reports of some users writing that they lost the feet quickly. This is surprising in view of its overall high-level craftsmanship. The fabric is a non-absorbent monofilament mesh, they claim that it resists bacteria and withstands sun exposure. In the video below you will see how the seat’s back poles are set in place, they are not a part of the frame, and you have them only in the Luxury model. Three different types of chairs. The Luxury Chair in three colors. The packed dimensions are 23.5 x 6.5 x 6.5 inches (60 x 17 x 17 cm) so you can transport this chair even on a bicycle and on a motorbike. Good packed size for such a type. Weight: 6 lb 5 oz (2.86 kg). Capacity: 300 lb (136 kg). Dimensions (W x D x H): 25 x 36 x 45 in (65 x 92 x 116 cm). Packed size: 23.5 x 6.5 x 6.5 in (60 x 17 x 17 cm). Seat height: 12 in (30 cm). Warranty: Nemo Lifetime Warranty. They claim that they proudly stand behind their products which therefore carry a lifetime warranty against defects in workmanship and materials. I love to show competitors to better understand the features of such an item. But there is nothing even remotely similar to this NEMO Stargaze chair. If I find something later, I shall add it here. So this NEMO Stargaze Recliner Luxury Chair is with a great back and head support. 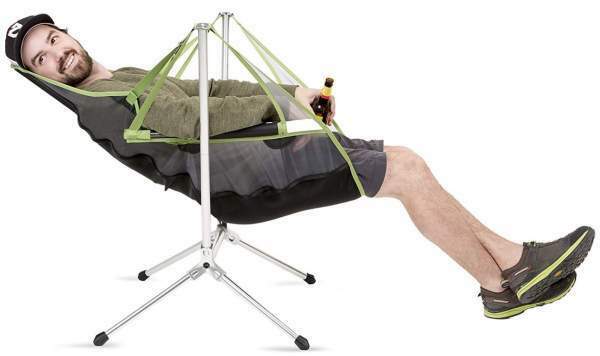 It is versatile so you can use it as a camp chair and as a swing chair. This is a unique and award-winning design. But this all comes at a price. Note that I am not paid by the manufacturer and this is not a sponsored text. 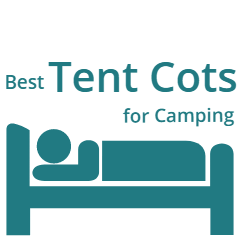 If you need something different please check under the category Camping Chairs here in the site, you have a huge number of models presented in detail. Please use the comment box below in the case of questions or comments. Have a nice day.